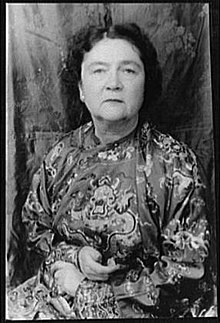 Marjorie Kinnan Rawlings (August 8, 1896 – December 14, 1953) was an American author who lived in rural Florida and wrote novels with rural themes and settings. Her best known work, The Yearling, about a boy who adopts an orphaned fawn, won a Pulitzer Prize for fiction in 1939 and was later made into a movie of the same name. The book was written long before the concept of young adult fiction, but is now commonly included in teen-reading lists. Marjorie Kinnan was born in 1896 in Washington, D.C., the daughter of Ida May (née Traphagen) and Arthur Frank Kinnan, an attorney for the US Patent Office. She grew up in the Brookland neighborhood and was interested in writing as early as age six, and submitted stories to the children's sections of newspapers until she was 16. At age 15, she entered into a contest a story titled "The Reincarnation of Miss Hetty", for which she won a prize. She attended the University of Wisconsin–Madison where she joined Kappa Alpha Theta sorority and received a degree in English in 1918. She was selected as a member of the local senior women's honor society on campus, which in 1920 became a chapter of the national senior women's society, Mortar Board. She met Charles Rawlings while working for the school literary magazine, and married him in 1919. Kinnan briefly worked for the YWCA editorial board in New York City. The couple moved to Louisville, Kentucky, writing for the Louisville Courier-Journal and then Rochester, New York both writing for the Rochester Journal, and Marjorie writing a syndicated column called "Songs of the Housewife". In 1928, with a small inheritance from her mother, the Rawlings purchased a 72-acre (290,000 m²) orange grove near Hawthorne, Florida, in a hamlet named Cross Creek for its location between Orange Lake and Lochloosa Lake. She brought the place to international fame through her writing. She was fascinated with the remote wilderness and the lives of Cross Creek residents, her "Florida cracker" neighbors, and felt a profound and transforming connection to the region and the land. Wary at first, the local residents soon warmed to her and opened up their lives and experiences to her. Marjorie actually made many visits to meet with Calvin and Mary Long to observe their family relationships. This relationship ended up being used as a model for the family in her most successful novel, The Yearling. The Longs lived in a clearing named Pat's Island, but Marjorie renamed the clearing "Baxter's Island." Marjorie filled several notebooks with descriptions of the animals, plants, Southern dialect, and recipes and used these descriptions in her writings. Encouraged by her editor at Scribner's, Maxwell Perkins, who was impressed by the letters she wrote him about her life in Cross Creek, Rawlings began writing stories set in the Florida scrub country. In 1930, Scribner's accepted two of her stories, "Cracker Chidlings" and "Jacob's Ladder", both about the poor, backcountry Florida residents who were quite similar to her neighbors at Cross Creek. Local reception to her stories was mixed between puzzlement concerning whom she was writing about, and rage, since one mother apparently recognized her son as a subject in a story and threatened to whip Rawlings until she was dead. Her first novel, South Moon Under, was published in 1933. The book captured the richness of Cross Creek and its environs in telling the story of a young man, Lant, who must support himself and his mother by making and selling moonshine, and what he must do when a traitorous cousin threatens to turn him in. Moonshiners were the subject of several of her stories, and Rawlings lived with a moonshiner for several weeks near Ocala to prepare for writing the book. South Moon Under was included in the Book-of-the-Month Club and was a finalist for the Pulitzer Prize. That same year, she and her husband Charles were divorced; living in rural Florida did not appeal to him. One of her least well-received books, Golden Apples, came out in 1935. It tells the stories of several people who suffer from unrequited love from people unsuited for them. Rawlings herself was disappointed in it, and in a 1935 letter to her publisher Max Perkins, she called it "interesting trash instead of literature." But she found immense success in 1938 with The Yearling, a story about a Florida boy and his pet deer and his relationship with his father, which she originally intended as a story for young readers. It was selected for the Book-of-the-Month Club, and it won the Pulitzer Prize for Fiction in 1939. MGM purchased the rights to the film version, which was released in 1946, and it made her famous. In 1942, Rawlings published Cross Creek, an autobiographical account of her relationships with her neighbors and her beloved Florida hammocks. Again it was chosen by the Book-of-the-Month Club, and it was even released in a special armed forces edition, sent to servicemen during World War II. Rawlings' final novel, The Sojourner, published in 1953 and set in a northern setting, was about the life of a man and his relationship to his family: a difficult mother who favors her other, first-born son and his relationship to this absent older brother. To absorb the natural setting so vital to her writing, she bought an old farmhouse in Van Hornesville, New York and spent part of each year there until her death. The novel was less well received critically than her Florida writings, and did little to enhance her literary reputation. She published 33 short stories from 1912–49. As many of Rawling's works were centered in the North and Central Florida area, she was often considered a regional writer. Rawlings herself rejected this label saying, "I don't hold any brief for regionalism, and I don't hold with the regional novel as such … don't make a novel about them unless they have a larger meaning than just quaintness." In 1943, Rawlings faced a libel suit for Cross Creek, filed by her neighbor Zelma Cason, whom Rawlings had met the first day she moved to Florida. Cason had helped to soothe the mother made upset by her son's depiction in "Jacob's Ladder". Cason claimed Rawlings made her out to be a "hussy". Rawlings had assumed their friendship was intact and spoke with her immediately. Cason went ahead with the lawsuit seeking $100,000 US for invasion of privacy (as the courts found libel too ambiguous). It was a cause of action that had never been argued in a Florida court. Zelma is an ageless spinster resembling an angry and efficient canary. She manages her orange grove and as much of the village and county as needs management or will submit to it. I cannot decide whether she should have been a man or a mother. She combines the more violent characteristics of both and those who ask for or accept her ministrations think nothing at being cursed loudly at the very instant of being tenderly fed, clothed, nursed, or guided through their troubles. Cason was represented by one of the first female lawyers in Florida, Kate Walton. Cason was reportedly profane indeed (one of her neighbors reported her swearing could be heard for a quarter of a mile), wore pants, had a fascination with guns, and was just as extraordinarily independent as Rawlings herself. Rawlings won the case and enjoyed a brief vindication, but the verdict was overturned in appellate court and Rawlings was ordered to pay damages in the amount of $1 US. The toll the case took on Rawlings was great, in both time and emotion. Reportedly, Rawlings had been shocked to learn of Cason's reaction to the book, and felt betrayed. After the case was over, she spent less time in Cross Creek and never wrote another book about Florida, though she had been considering doing a sequel to Cross Creek. With money she made from The Yearling, Rawlings bought a beach cottage at Crescent Beach, ten miles south of St. Augustine. In 1941 Rawlings married Ocala hotelier Norton Baskin (1901–1997), and he remodeled an old mansion into the Castle Warden Hotel in St. Augustine (currently the Ripley's Believe it or Not Museum). After World War II, he sold the hotel and managed the Dolphin Restaurant at Marineland, which was then Florida's number one tourist attraction. Rawlings and Baskin made their primary home at Crescent Beach, and Rawlings and Baskin both continued their respective occupations independently. When a visitor to the Castle Warden Hotel suggested she saw the influence of Rawlings in the decor, Baskin protested, saying, "You do not see Mrs. Rawlings' fine hand in this place. Nor will you see my big foot in her next book. That's our agreement. She writes. I run a hotel." After purchasing her land in New York, Rawlings spent half the year there and half the year with Baskin in St. Augustine. Her singular admitted vanity was cooking. She said, "I get as much satisfaction from preparing a perfect dinner for a few good friends as from turning out a perfect paragraph in my writing." Rawlings befriended and corresponded with Mary McLeod Bethune and Zora Neale Hurston. Zora Neale Hurston visited her at Cross Creek. Rawlings resisted social norms of the time in allowing Hurston, an African-American, to sleep in her home instead of relegating her to the tenant house. Rawlings' views on race relations were much different than her neighbors', castigating white Southerners for infantilizing African Americans and labeling their economic differences with whites "a scandal", but simultaneously considered whites superior. She described her African-American employee Idella as "the perfect maid". Their relationship is described in the book Idella: Marjorie Rawlings' "Perfect Maid", by Idella Parker and Mary Keating. Biographers have noted her longing for a male child through her writings, as far back as her first story as a teenage girl in "The Reincarnation of Miss Hetty", and repeated throughout several works, letters, and characters, most notably in The Yearling. In fact, she stated that as a child she had a gift for telling stories, but that she demanded all her audiences be boys. Together in the fire of my despising..."
She was criticized throughout her career for being uneven with her talent in writing, something she recognized in herself, and that reflected periods of depression and artistic frustration. She has been described as having unique sensibilities; she wrote of feeling "vibrations" from the land, and often preferred long periods of solitude at Cross Creek. She was known for being remarkably strong-willed, but after her death, Norton Baskin wrote of her, "Marjorie was the shyest person I have ever known. This was always strange to me as she could stand up to anybody in any department of endeavor but time after time when she was asked to go some place or to do something she would accept — 'if I would go with her.'" In her autobiography Cross Creek first published in 1942, Rawlings described how she owned many acres of land and also hired many people to help her with day-to-day chores and activities. An entire chapter of the book is dedicated to one woman she hired, whose name was Beatrice, but who was affectionately known as "GeeChee", because the woman was ethnically part of the GeeChee people. In the book Rawlings said GeeChee's mother lived in nearby Hawthorne, Florida and GeeChee was blind in one eye from a fight in which she had been involved. GeeChee was employed by Rawlings on and off for nearly two years in which GeeChee dutifully made life easier for Rawlings. GeeChee revealed to Rawlings that her boyfriend named Leroy was serving time in prison for manslaughter, and asked Rawlings for help in gaining his release. She arranged for Leroy to be paroled to her and come work for her estate, and had a wedding on the grounds for Beatrice and Leroy. After a few weeks, Leroy aggressively demanded more earnings from Rawlings and threatened her. She decided he had to leave, which caused her distress because she did not want GeeChee to go with him, and was sure she would. GeeChee eventually decided to stay with Rawlings, but GeeChee began to drink heavily and abandoned her. Weeks later, Rawlings went out searching for GeeChee and drove her back to her estate, describing GeeChee as a "Black Florence Nightingale". GeeChee was unable to stop herself from drinking, which led a heartbroken Rawlings to dismiss her. Rawlings stated in her autobiography "No maid of perfection — and now I have one — can fill the strange emptiness she left in a remote corner of my heart. I think of her often, and I know she does of me, for she comes once a year to see me". When Cross Creek was turned into a 1983 film, actress Alfre Woodard was nominated for the Academy Award for Best Supporting Actress for her performance as GeeChee. Rawlings died in 1953 in St. Augustine of a cerebral hemorrhage. She bequeathed most of her property to the University of Florida, Gainesville, where she taught creative writing in Anderson Hall. In return, her name was given to a new dormitory dedicated in 1958 as Rawlings Hall which occupies prime real estate in the heart of the campus. Her land at Cross Creek is now the Marjorie Kinnan Rawlings Historic State Park. Norton Baskin survived her by 44 years, passing away in 1997. They are buried side-by-side at Antioch Cemetery near Island Grove, Florida. Her tombstone, with Baskin's inscription, reads "Through her writing she endeared herself to the people of the world." Rawlings' reputation has managed to outlive those of many of her contemporaries. A posthumously published children's book, The Secret River, won a Newbery Honor in 1956, and movies were made, long after her death, of her story Gal Young Un, and her semi-fictionalized memoir Cross Creek (Norton Baskin, then in his eighties, made a cameo appearance in the latter movie as a man sitting in a rocking chair). In 1986, Rawlings was inducted into the Florida Women's Hall of Fame. 3 years later, in 1989, she won the Florida Folk Heritage Award. In 2008, the United States Postal Service unveiled a stamp bearing Rawlings' image, in her honor. She was named a Great Floridian in 2009 by the state of Florida. The program honors persons who made “major contributions to the progress and welfare" of Florida. 1912 "The Reincarnation of Miss Hetty"
1932 "A Crop of Beans"
1933 "Benny and the Bird Dogs"
1936 "A Mother in Mannville"
^ a b c Marjorie Kinnan Rawlings House and Farm Yard, Women's History Month 2006-A National Register of Historic Places Feature; accessed December 8, 2014. ^ a b c Bloom, Harold, ed. "American Women Fiction Writers, 1900-1960", Volume 3. Chelsea House, Philadelphia (1998). ^ "Notable Thetas: Marjorie Kinnan Rawlings". Kappa Alpha Theta website. Retrieved on December 30, 2007. ^ "Marjorie Kinnan Rawlings Biography". Marion County, Florida. Archived from the original on September 30, 2006. ^ a b c d e f Bellman, Samuel. Marjorie Kinnan Rawlings. Twayne Publishers, New York: 1974. ^ a b c "On Location: The Central Florida Of 'The Yearling'". NPR.org. Retrieved 2019-02-15. ^ a b c Bigelow, Gordon. Frontier Eden: The Literary Career of Marjorie Kinnan Rawlings. University of Florida Press, Gainesville; 1956. ^ a b c Acton, Patricia. Invasion of Privacy: The Cross Creek Trial of Marjorie Kinnan Rawlings. University of Florida Press, Gainesville: 1988. ^ a b Rawlings, Marjorie K. Cross Creek, 1942. ^ Hines, Laura. Invasion of Privacy (book review), in Michigan Law Review, Vol. 88: 1925. ^ Evans, Harry. "Marjorie Kinnan Rawlings: Part One", The Family Circle. May 7, 1943: pp 10-11. ^ Pfeiffer, Sarah. "Only One Road to Success-Says Marjorie Kinnan Rawlings", Christian Science Monitor, September 4, 1940. ^ Letters to MKR from, A-K, uflib.ufl.edu; accessed September 16, 2015. ^ ZNH and MKR, uflib.ufl.edu; accessed December 8, 2014. ^ Evans, Harry. "Marjorie Kinnan Rawlings: Part One", The Family Circle. May 7, 1943: p. 18; accessed December 8, 2014. ^ Cross Creek Ch.10 accessed September 16, 2015. ^ Rawlings Hall at the University of Florida, ufl.edu; accessed September 16, 2015. ^ "IMDb – Cross Creek, Full Cast and Crew". imdb.com. Retrieved April 11, 2016. ^ "Marjorie Kinnan Rawlings - Division of Historical Resources - Florida Department of State". dos.myflorida.com. Retrieved 2019-02-15. ^ "Great Floridians Program – Division of Historical Resources – Florida Department of State". dos.myflorida.com. Retrieved September 16, 2015. Wikimedia Commons has media related to Marjorie Kinnan Rawlings. Robert Middendorf and Rodger Tarr collections of Marjorie Kinnan Rawlings at the University of South Carolina Irvin Department of Rare Books and Special Collections. The Friends of the Marjorie Kinnan Rawlings Farm, Inc.